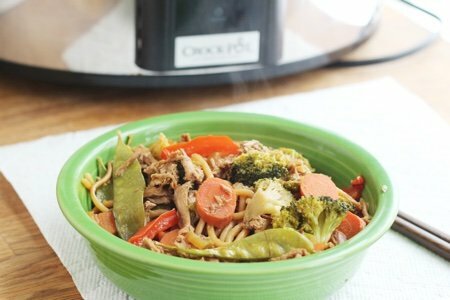 There comes a time when you have to stop ordering take-out and start making your own slow cooker lo mein. It is not hard and you can pack yours with a ton of vegetables. This recipe is not fried so it is much healthier for you than the lo mein you get at most Chinese restaurants. Two of my other favorite healthier recipes are my Easy Hot and Sour Soup and my Chinese green beans. 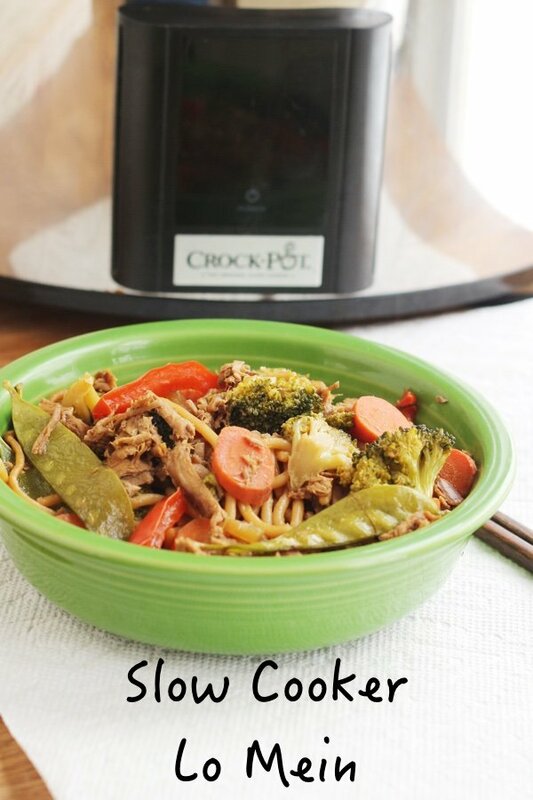 I love this version because it makes a great lunch the next day (heats up in the microwave and still tastes good). You can find oyster sauce and Sriracha sauce in the Asian section of your supermarket. They last forever so they are worth the investment. This recipe looks like it has a lot of ingredients (which it does)– but it happens in two distinct steps. It is like two recipes in one. The first step is you slow cook the pork in the marinade for a while. This takes very little time to set up so you can do it before work and leave it all day. Then, when the pork has finished cooking – you cook the vegetables in the sauce for 15 minutes (and cook a pot of spaghetti). I start my pork in the AM, and then when I am ready for the meal. I chop the veggies and cook the spaghetti. It really isn’t hard. My version is much lower in fat than the version you will get from your local Chinese restaurant and I don’t fry anything in oil. Also, I include as many vegetables as my children can stand in my version and I go light on the noodles. It is pretty different than the lo mein that I get at my local spot so set expectations appropriately at home. My son was not happy but my daughter ate a bunch of it ( I can NEVER get them on the same page). Do you make lo mein at home? How do you do it? 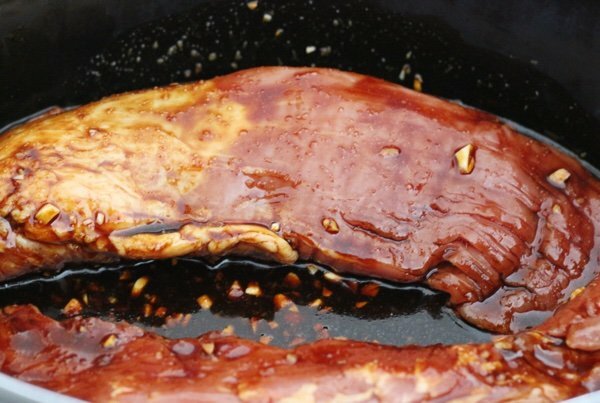 Place pork tenderloin into a 6 quart slow cooker. Mix garlic, soy sauce, sugar, oyster sauce, ginger, sesame oil, and Sriracha in a small bowl and pour over pork. Turn it over a couple of times to coat. Cook on low for 7-8 hours or high for 3-4 hours. When the pork is finished, remove it from the slow cooker. 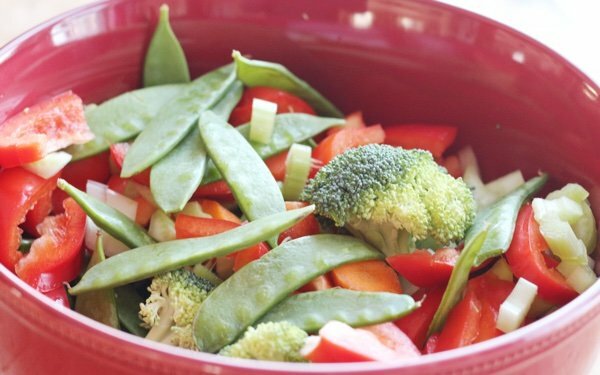 Turn the cooker to high and add the broccoli, carrots, celery, snow peas, and red pepper and cook until tender (about 15 minutes). 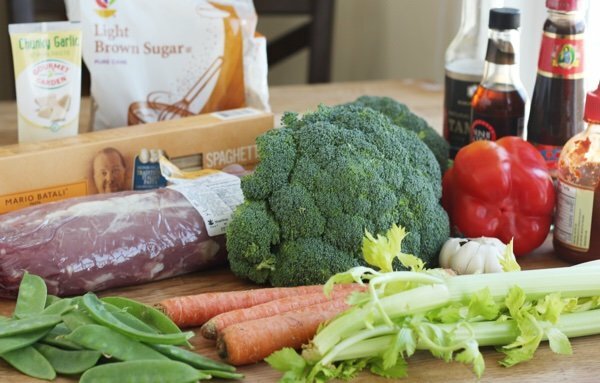 While the vegetables are cooking, shred the pork with 2 forks and cook the spaghetti following packaged directions. After the vegetables have finished add the pork and spaghetti and toss. Serve immediately. Does anyone have a vegetarian version of this dish? I wonder if it would work with tofu, or is the meat essential for flavor? Joan, I am going to follow this to see if we get any suggestions. I would love to do the same. Thanks for asking! I would also use coconut aminos to save some sodium. Snack girl, this looks really good and I would like to try this but as I am trying to lower my cholesterol and the fact that your nutritional values never include that information makes it hard to decide this. Why do you never include this info, I consider it as important as sugar and sodium content. I really enjoy your site and have made quite a few recipes but this extra info would really be helpful. I'd love to try this but I'm allergic to oyster sauce. What can you substitute for the oyster sauce? Instead of the spaghetti, I would use zucchini zoodles. I really enjoy the taste and texture of stir fried foods. Do the veggies in this yummy-sounding recipe retain their crispness when prepared in a crock pot? I realize that they are cooked for a brief time by crock pot standards, but soggy vegetables are a real turn-off for me, especially in Asian dishes. I'll bet the pork tastes delicious cooked in such a tasty seasoning sauce! I'm definitely going to try this dish this coming weekend when my "official tasters" will be here to share it with me. Bet there won't be any leftovers!